New Year’s Eve is one of the most special days of the year. It’s the time for us to look back at the year that has gone by, remembering the moments that made it special and all the things we did, but also to look forward to the year ahead, a blank slate just waiting to be filled up with new memories. It’s a day of celebration all around the world and a special moment to spend with friends, family members, and other loved ones. One of the best places to celebrate New Year’s Eve is in a major city. Big urban locations around the United States organize a variety of exciting special events to ring in the New Year, and it’s definitely worth the journey to head to one of these locations and partake in the festivities. 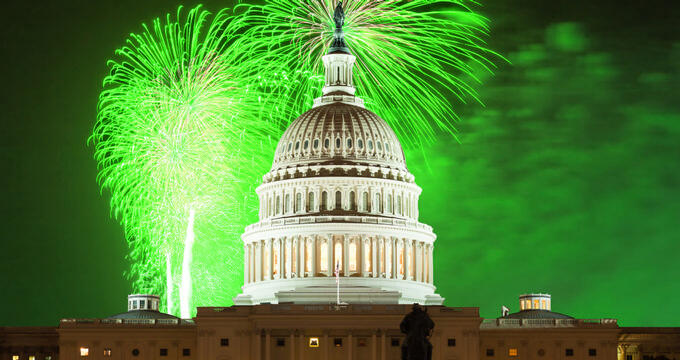 One of the best American cities to make the most of New Year’s Eve is Washington, DC. New York City might be the most famous city in the world on December 31, but there’s nowhere quite like the nation’s capital. Washington DC is a beautiful place to visit at any time of year. Home to dozens of globally famous monuments and landmarks like the White House, the Capitol Building, the Washington Monument, and the Lincoln Memorial, DC is a super spot to welcome the arrival of a brand new year, with dozens of great things to do on New Year’s Eve. Let’s take a look at some of the best Washington DC activities for New Year. The number one activity all around the world on New Year’s Eve is to head down to a major city and observe the annual fireworks displays. In big cities all around the world, from London to Tokyo to Sydney and New York City, fireworks shows are held as the seconds tick down to midnight. Washington DC is no exception. In fact, there are several different fireworks shows to enjoy in the DC area on New Year’s Eve. In areas like Baltimore, Williamsburg, Winchester, and Alexandria, fireworks shows are part of the traditional New Year's Eve celebrations. The Potomac River is one of Washington DC's most beautiful natural attractions. Throughout the year, all sorts of events are held on the banks of the Potomac and it's not uncommon to see countless kayakers taking to this waterway on a typical day in the nation's capital. On New Year's Eve, there's nothing more romantic and special than heading out on a boat tour of the Potomac River. Several boat tours operate on the Potomac after the sun has set on December 31, providing glasses of champagne and fine dining opportunities for everyone aboard to ring in the new year in style. First Night celebrations began in Boston, not too far away from Washington DC, and plenty of other cities, establish around states like Maryland and Virginia, have taken on the tradition. First Night celebrations are organized in areas like Annapolis, Alexandria, Williamsburg, Winchester, and Charlottesville each and every year, including live music, great food, fireworks shows, and much. These events are a perfect way for families and friends to celebrate the New Year together. A good old-fashioned New Year’s Eve party or gala is another grand way to enjoy the evening of December 31. Dozens of popular parties and gatherings are held in the DC area at this special time of year. Hotels, bars nightclubs, and more will organize various events, but the best locations will sell out ahead of time, so it's wise to plan ahead and reserve your tickets while you can. New Year’s Eve parties in Washington DC can vary from subdued, elegant affairs in high class restaurants to costume parties and more. If you’re looking for something new and original to enjoy on New Year’s Eve in America’s capital, there are all kinds of other activities to enjoy in DC on December 31. The Georgetown Waterfront is always a lively place to welcome in the New Year, with large crowds of people gathering down by the shores of the Potomac River each year. Sports bars, live music venues, and other fun locations around DC will all have their own unique ways to honor the occasion too, so be sure to look around and find the best activity to make your New Year’s Eve a night to remember.